The largest cause of child hospital admissions between the ages of five and nine is tooth decay. Therefore, it is important to ensure that your whole family cares for their teeth and practices an established dental routine. Such dental practices should start young, and you should encourage your children to start routines and practise the same level of dental care that you do so that they continue these important measures to prevent tooth decay throughout their lives. However, oral care is no less important for adults, and you must ensure that you set a good example for your family by taking the time to establish good dental hygiene such as brushing and flossing. Regular check-ups are the best way to prevent oral health problems such as tooth decay and gum disease. Your dentist will be able to find and alert you to any dental problems you may have, as well as potential problems in the future. By catching diseases and inflammations early, this will lessen the likelihood of having to have more invasive surgery. The best way to encourage children to go to the dentist throughout their lives is by taking them to the dentist from a young age. In fact, you should start to take your child to the dentist as soon as their first teeth appear. The health of milk teeth is just as important as the health of adult teeth, as the quality of your child’s milk teeth can affect the health of their adult teeth when they grow through. Taking your child to the dentist as soon as possible also lessens the chance of your child being scared of the dentist as they will understand what is going to happen and that it will not be painful or scary. Nearly a quarter of children have rotting teeth by the time that they start school; your dentist will be able to find dental decay early and teach your child the best ways to brush their teeth and look after their dental hygiene. If tooth decay is a particular problem for your child, you may want to discuss having dental sealants put on your child’s teeth. Dental sealants are plastic coatings that are placed on your child’s teeth to help prevent decay by keeping harmful bacteria away from their surfaces. However, regular check-ups are not just important for children. Half of all adults in England do not visit the dentist. You and your family should make a dental appointment annually, and, if you are prone to tooth problems, this may be increased to once every six months. Over a third of adults have never been to the hygienist. Many patients avoid the hygienist due to its cost, which is usually around £50 and is not available for free on the NHS. However, going to the hygienist is vital to improve the quality of your teeth and ensure that they remain largely plaque free. You should visit the hygienist every six months. Check for gum erosion and gum Your hygienist will also perform other checks to ascertain that your oral health is positive. If you are in search of high-quality dental supplies for your practice, Kent Express offers good value dental products, from small equipment such as water scalers to autoclaves and ultrasonic baths. Kent Express collaborates with practices through their knowledgeable team, who can provide the best equipment for your practice’s individual needs. The hygienist is not just for adults, though, and regular visits for the whole family are essential for healthy smiles. The most beneficial aspect of the hygienist for children and adults alike, is that your hygienist will take some time to educate and advise you on how to improve your oral care and ways that you can incorporate this into your daily routine. For instance, if you or your child struggles with the correct way to floss, then your hygienist will be able to demonstrate the correct way to achieve this. Another reason why you should visit your dentist with your child regularly is that they will be able to recommend an orthodontist to you. Your child may need orthodontic treatment for urgent or cosmetic purposes, such as braces or retainers. Children should visit the orthodontist at the age of 7, when their adult teeth have all emerged, as this will indicate whether their mouth is overcrowded or if they have an overbite. At this time, you will also still be able to get orthodontic treatment on the NHS for non-cosmetic purposes. Additionally, straightening your child’s teeth is important so that they can care for them more easily throughout their lives, and will be able to reach all their surfaces more easily. Treatment lasts for around 2 years, and you will need to visit the orthodontist every 6 weeks to check if they need tightening and whether the braces are being kept clean enough. However, if you believe that your teeth are protruding or crooked as an adult, you can still have orthodontic treatment. Although treatment is not on the NHS, 1 in 100 orthodontic patients are adults, and having braces fitted can help you to have a healthy smile if you struggle with certain aspects of your dental care. Dental routines are important to establish from a young age. The younger your child starts to care for their teeth, the more likely that they will continue to care for their teeth throughout their lives. You should supervise your children’s brushing routines up until the age of 7. Children should brush twice daily with a pea-sized amount of fluoride toothpaste and a soft bristled brush. You should particularly look out for children brushing too hard or not covering all the surfaces of their teeth. Some children will also brush their teeth backwards and forwards, rather than in circular motions. If children are reluctant to take part in routines, you should brush your teeth with them. This will encourage them to brush their teeth thoroughly, allow them to copy your technique, and allow you to check whether they are brushing correctly. Another good way to encourage a dental routine is to make their routine fun, by playing games such as brushing to music and rewarding them for a good brushing routine. Adults should also brush twice daily with fluoride toothpaste for at least two minutes a day. You should brush gently and ensure that you do not hit your gumline, as this can damage your gums and lead to gum erosion. However, simply brushing only covers 60% of your teeth’s surfaces. Therefore, adults should also floss between their teeth as this ensures that bacteria is removed from the narrow gaps between your teeth right up to your gumline. You should ensure that you floss the edges of each tooth, with the floss turned at a 45-degree angle towards your gumline. Flossing should be done in a soft, rocking motion as this will ensure that you can floss without damaging your gums. If you floss too hard, you can potentially help increase the pace of gum erosion and allow bacteria to infect your gums. Adults should also consider using mouthwash. Although this is not necessary for your dental routine, it can improve your dental hygiene by improving halitosis and protecting your teeth from plaque. However, mouthwashes should only be used over half an hour apart from the rest of your dental hygiene routine, as they can potentially wash the lasting fluoride off your teeth. 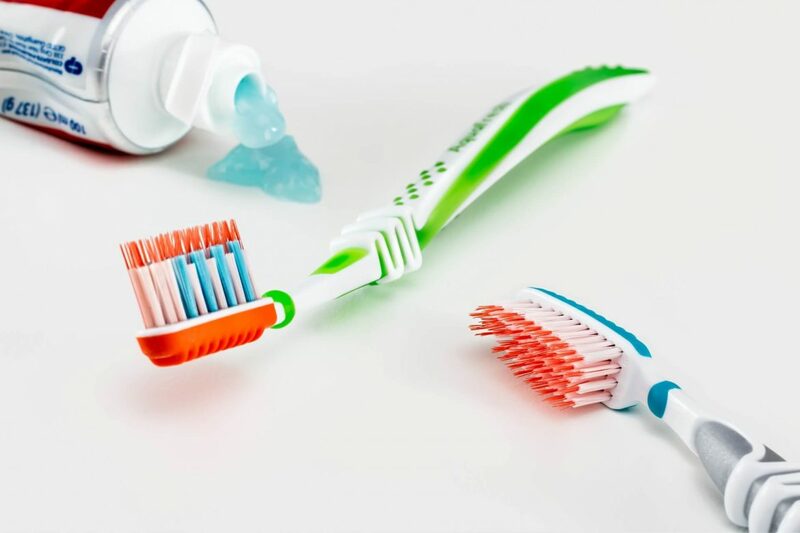 You should look for mouthwashes that contain fluoride, as this will prevent a build-up of plaque and active anti-bacterial ingredients which can kill potential, plaque-forming bacteria, for instance. You should speak to your dentist when considering mouthwash, as they will be able to guide you to the best mouthwashes for your use. Sugar can contribute greatly towards tooth decay as this erodes the enamel on your teeth. This leaves your mouth vulnerable to harmful bacteria which can infect your gums or cause a build up of plaque. However, the minerals in your saliva and that of fluoride in toothpaste reproduces the minerals that enamel contains, allowing your teeth to re-strengthen. However, reducing the amount of sugar that your family consumes is vital to a healthy smile. Every time you consume sugar, the acids found in sugar attack your teeth for 20 minutes after each bite. This means that sugary drinks are especially bad for you and your children, as sugars will attack their teeth for 20 minutes after each sip. Over time, this can cause cavities, especially in children, whose teeth are more susceptible to decay. Therefore, you should reduce your family’s intake of fizzy drinks and sugary snacks, or only consume sugary substances around meal times, as this will help to reduce acidity. You should also limit the time that you spend consuming sugary substances. For instance, you should consume a snack or drink all at once so that the acid attack lasts for a shorter length of time. You should also wait half an hour after sugary snacks to brush your teeth as this allows the enamel to reharden, and drink plenty of water after you eat a snack, as this will help to dilute the acids in your mouth and stabilise your pH levels. Drinking a lot of water around meal times or when consuming sugary drinks can be a simple protection against sugary drinks. Water washes away debris and left-over food that can potentially cause bacteria, as well as diluting the acids created in your mouth when you eat sugary substances. Water also replenishes your saliva, which is important as saliva contains minerals such as calcium which help to protect your teeth. Drinking water can help to reduce the risk of dry mouth, which can aid tooth decay through the lack of minerals that your mouth will come into contact with. Additionally, drinking water rather than sugary drinks is not only good for your family’s health and weight. Drinking water as a replacement for flavoured drinks means that your mouth will be coming into contact with less acidic and sugary substances which can cause tooth decay. In many areas, unfiltered water contains additional fluoride which can strengthen your teeth and prevent tooth decay, like a more natural toothpaste. This extra fluoride will help to add to the minerals that your teeth come into contact with through using toothpaste. Quitting smoking is also a great way to improve your family’s teeth. Smoking can not only discolour your teeth, but it can lead to a great chance of periodontal disease and gum infections. This is because smoking encourages buildups of plaque and tartar which can cause cavities., eventually lead to tooth loss and further dental problems. It can also lead to an increased chance of getting oral cancer and other illnesses such as infections, as smoking greatly lowers your immune system’s effectiveness. However, quitting smoking as soon as possible allows your teeth to strengthen and can greatly increase your chance of repairing your teeth as you grow older. Dental care is important for all the family, whatever age you are. By instilling proper brushing techniques and dental routines into your children’s lifestyle, they will be able to continue good dental care throughout their lives. However, even as an adult, it is not too late to improve your dental hygiene through regular check-ups, a healthy lifestyle, and a good dental routine.